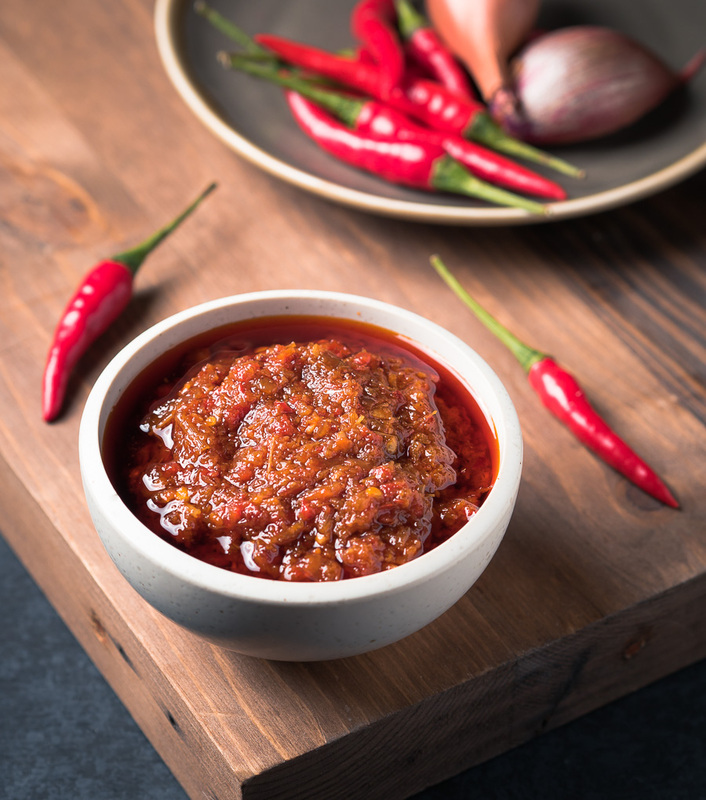 Vietnamese sate sauce is a garlicky, spicy flavour bomb you can throw at any Asian braise, soup, stir fry or noodle dish. Or smear it on chicken and grill. It’s loaded with big, bold southeast Asian flavours. This is not that Indonesian peanut sauce for grilled skewers. That’s satay sauce. This is sate sauce. Totally different beast. I’m not saying it wouldn’t be delicious on grilled skewers. But it is not the same. It’s waiting to be discovered. I see it at some Vietnamese restaurants. It’s a table sauce. For when you just want to add a flavour boost. But I don’t see it anywhere else. Too bad. People are missing out. It is hot and sweet and salty. Garlicky. With some lemongrass thrown in. Drooling yet? Use it like you would sriracha. It’s a bit hotter maybe but it’s so much better. There is sriracha in Vietnamese sate sauce. This version anyway. But it’s got so much more going on. 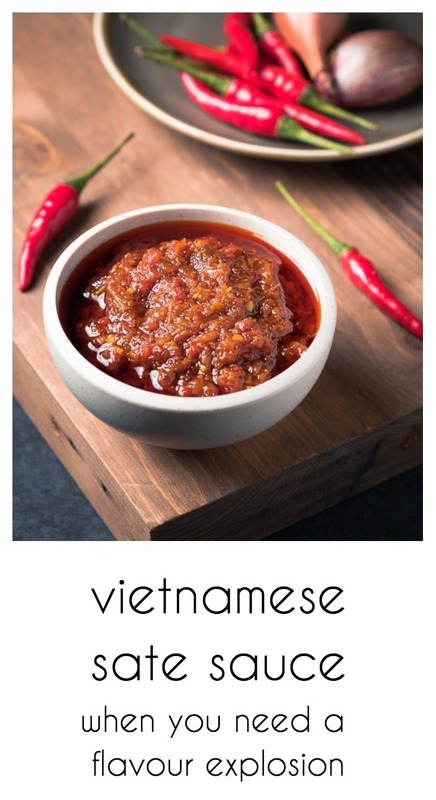 There aren’t many recipes for Vietnamese sate sauce out there. Not sure why but they all seem to be very close variations on a theme. The definitive recipe is the one on Viet World Kitchen. Everybody else has just copied it word for word. That version is damn good but it’s also damn hot. Like yowza hot. The glebekitchen tweak to this recipe is to tone it down. Keep the big, bold taste but dial back the fire. That’s why there’s only a couple Thai chilies. Mostly it’s red finger hot chilies. All the flavour. Half the heat. Or leave the Thai chilies out altogether. Not so hot at all then. Why bother doing it this way? Because it’s so good you will want to add more. And more. And more. Then it will be too spicy to eat. For most anyway. Vietnamese sate sauce glebekitchen style. Load it on fearlessly. Enjoy. 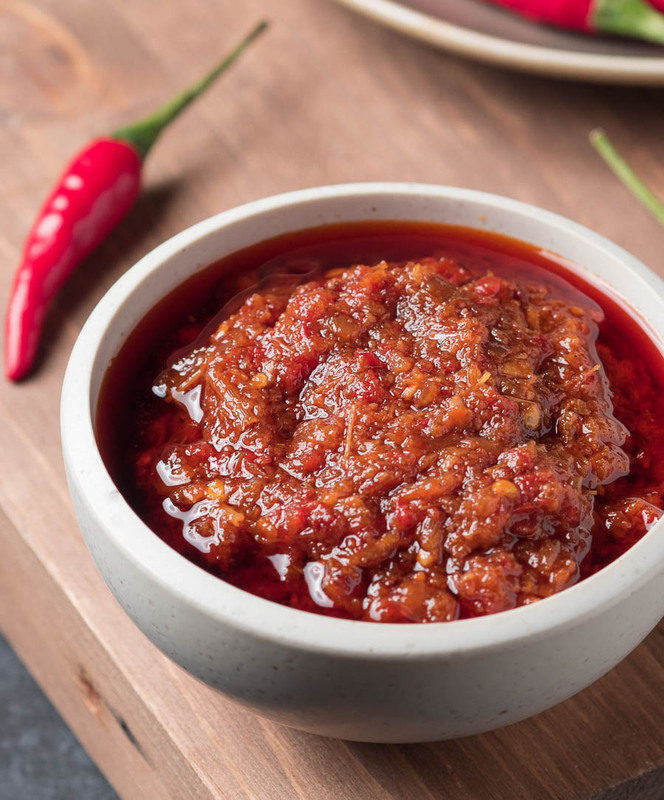 Vietnamese sate sauce makes a great condiment for any asian stew, soup or grilled or roasted poultry. Using a small food processor chop the garlic, shallot, lemongrass and chilies separately. You want the chilies and lemongrass to be pretty finely chopped. Set the lemongrass and chilies aside. Heat the vegetable oil over medium low heat. Add the garlic and cook for 10 minutes. It should bubble lightly. You don't want it to colour though. Be careful. Once the garlic has cooked for 10 minutes, add the shallots and cook for another 10 minutes. Watch closely. Burning is bad. After 20 minutes add the lemongrass and cook another 10 minutes or so. Once the lemongrass has cooked about 10 minutes add the fresh, chopped red chilies and cook for 5 minutes. Now add the crushed chilies and cook another 5 minutes. Stir in the fish sauce and sugar. Cook another 2-3 minutes. Mix in the sriracha sauce. Taste and adjust for salt. This sate sauce will keep in the fridge for a month or more. Use it in asian stews, soups or mix it with a bit of mayonnaise and use it in sandwiches. If you want it even milder leave out the Thai chilies altogether. In sides and stuff, vietnamese. Bookmark the permalink.